This week's new Jane Austen stamps prompted me to see if I could find some of my favourite female authors on stamps. I was bitterly disappointed! Why is there no Iris Murdoch stamp, either here in Britain or in Ireland? And, even worse, probably, why hasn't France honoured Simone de Beauvoir yet??? Is my taste in female authors - limited though it may be - so extravagant that my heroines don't deserve philatelic recognition? Just as well then that I got a little encouragement in the form of the suggestion to check out the Famous German women set, as it would undoubtedly include an author or two. So I did and it does! 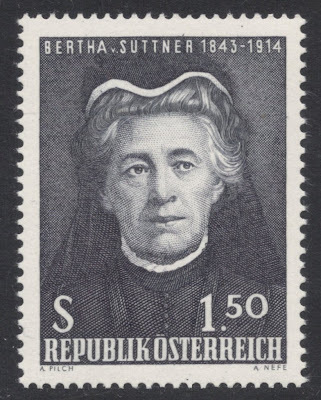 Let me introduce you to Baroness Bertha von Suttner! 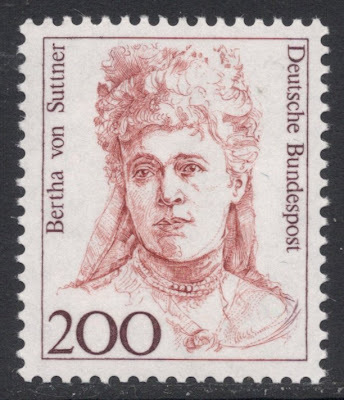 Bertha von Suttner was in many ways the opposite of Jane Austen. 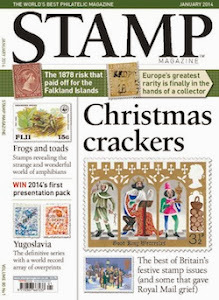 In Jeff Dugdale's excellent feature on Jane Austen, in the March 2013 issue of Stamp Magazine, he states that it is remarkable how the turbulent times Austen lived in were never mirrored in her books. For Baroness Von Suttner, the turbulent world was the sole reason for her writing, and her work is basically one large political comment on the world she lived in. 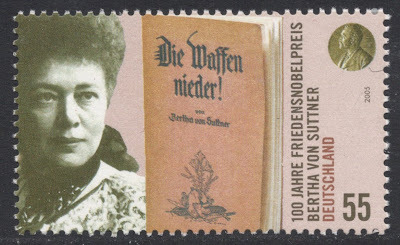 Bertha von Suttner was what is known as a radical pacifist, which at the time meant that she involved herself in organisational pacifism. She has become famous for writing her book Die Waffen nieder! (Lay down your arms!) which was praised by the likes of Leo Tolstoy. She later edited an international pacifist journal, which was named after her book. 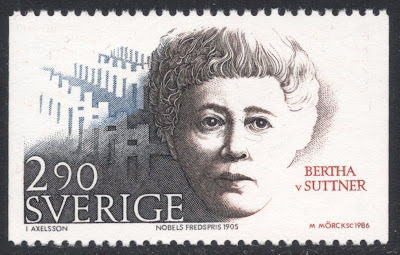 Early on in her pacifist 'career', she worked as a secretary to Alfred Nobel for a short while, and stayed in touch with him throughout his life. It is often thought she played a major part in Nobel's decision to include a Peace Prize in his will. 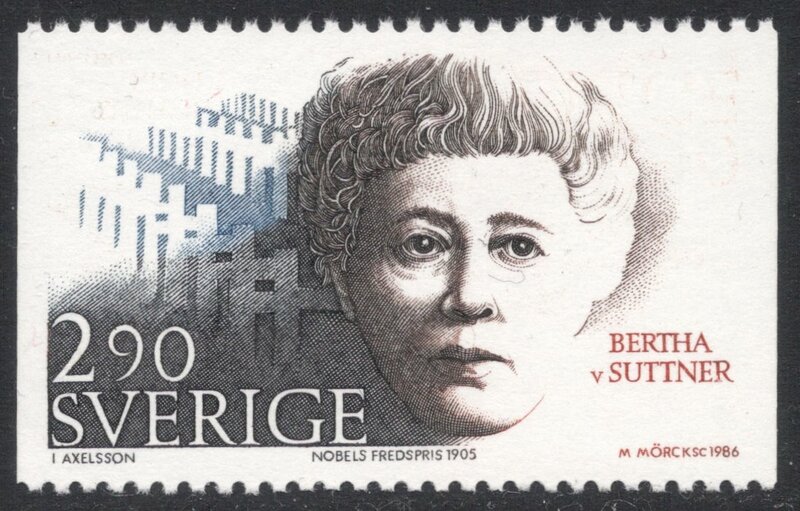 Fittingly, she herself was awarded the Nobel Peace Prize in 1905. 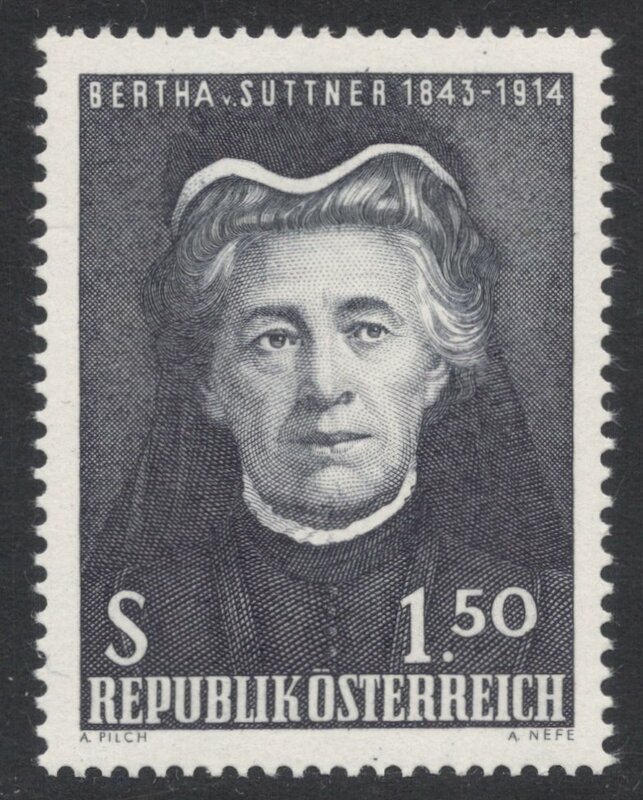 Though included in the German set, Von Suttner was actually Austrian and in her home country she founded a national pacifist organisation in 1891. She may therefore also be found on a number of Austrian stamps. 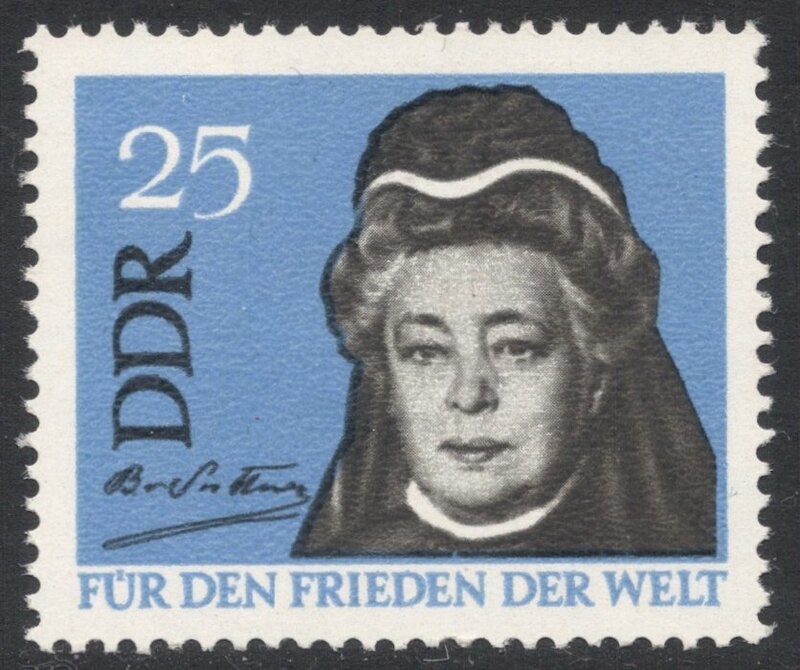 As a philatelic aside: the Bertha von Suttner stamp from that German definitive set stands out for more reasons than just an interesting biography. 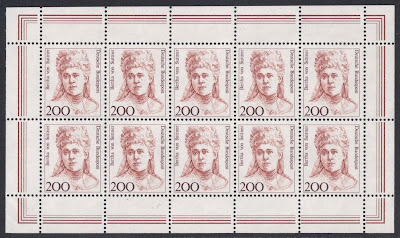 Together with the 300pf value it is the only stamp which has been available in both large sheets of 100 and subsequent smaller sheetlets of 10. 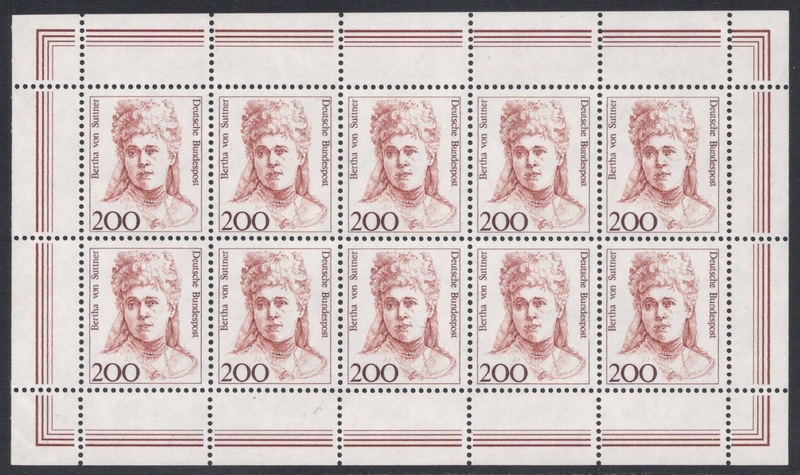 Though the actual stamp remains the same, marginal copies can be collected which show the difference: those of the larger sheets having blank margins, whereas the sheetlet version has a multi-line frame printed on the margins. So, even if organised pacifism isn't your thing, it's still worthwhile checking out your Suttner stamps! 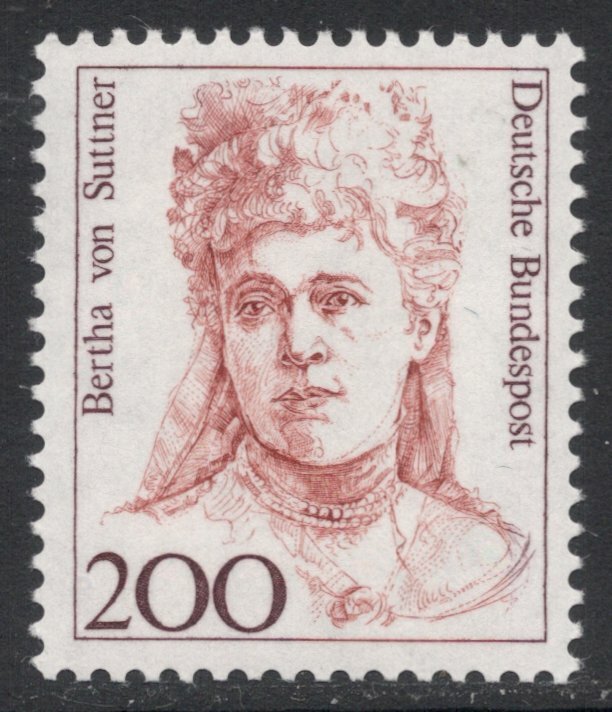 PS: Want to know more about Bertha von Suttner? Visit this gorgeous website in honour of her. Look westward, tovarich. The U.S. has issued many. Actually Bruno, if the German set had failed me I would have gone to the US and look among those fantastic 1980s onwards Great American stamps, because I love those just as much as I love those German stamps. 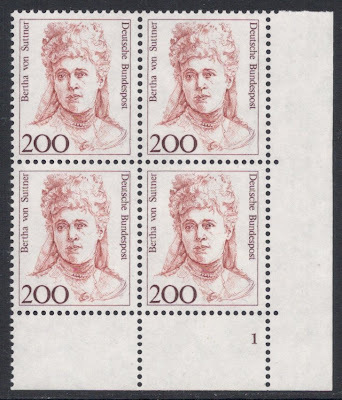 It's just that I had more Suttner stamps at hand so I could do the blog in one go without having to source any images! Thanks for putting together this overview of Bertha von Suttner postage stamps from German speaking countries! 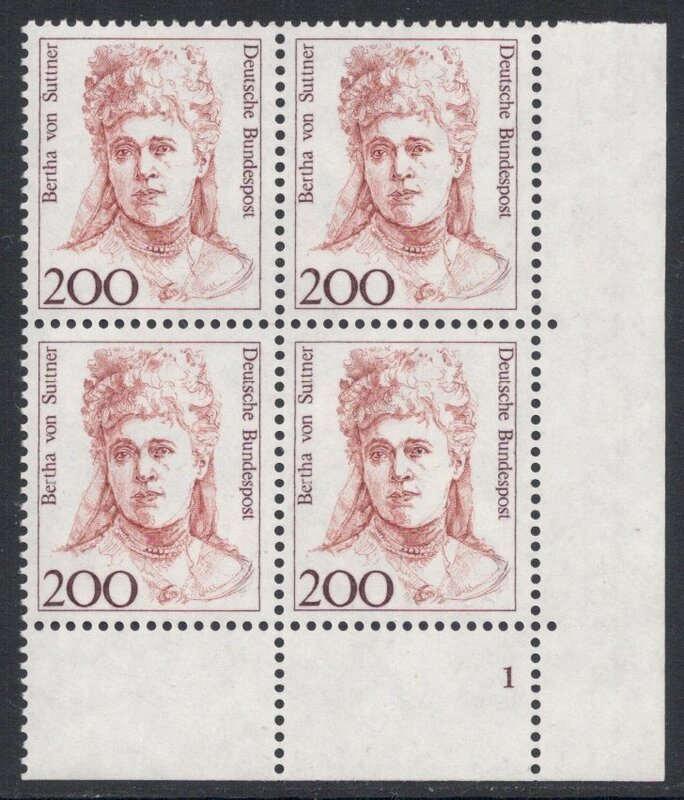 On february 13 2013, the Czech Republic also issued a new BVS postage stamp to commemorate the 170th anniversary of her birth. With your permission, can I add the link to your blog on the BVS Facebook page as well as on berthavonsuttner.com? Glad you like it! Yes, please feel free to add the link. I had a quick look at the BVS website and am quite impressed. I'll add it as a PS to the blog, so it gets a bit more attention from readers. Thanks for the great compliment! The BVS website was launched in january of this year and is still in its early stages, so we can definitely use some more attention. I will add your blogpost on BVS-Facebook tomorrow. Thanks again for helping out! Machin Competition - The Result!